Wind and rain got you down? 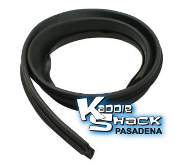 Replace those leaky door seals. Sold in pairs. A very common cause of overheated air-cooled engines is the lack of a proper seal in the engine compartment. Make sure your seals are there and in good working order. 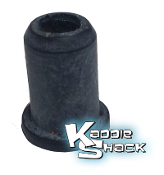 Change that ratty old fender beading with this high quality beading. This one has cut-outs for fender bolts, making it super easy to install. Comes in pairs, so one package does two fenders. Quality door handle seals to replace missing or damaged ones. This is the seal that installs underneath the hood handle on '67 and earlier Bugs. 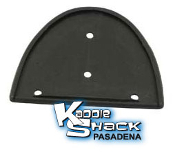 Quality hood handle seals to replace missing or damaged ones. 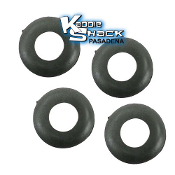 Quality turn signal light seals to replace those crusty old cracked and leaky ones. 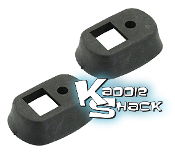 Quality taillight seals to replace those crusty old cracked and leaky ones. This seal installs under the chrome ring for the lens and the base of the light to keep water from entering the electrical portion of light assembly. Sold each. This seal installs between the fender and the base of the taillight on late model cars. Sold each. 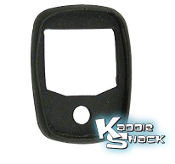 Quality license light cover seal to replace your crusty old cracked and leaky one. This seal is sandwiched between the headlight lens and the metal housing. It prevents water from getting into the headlight, as well as preventing the lense from vibration and cracking. This seal installs between the body and the metal headlight housing. This is the tube that snaps into the back of the headlight bucket to help drain any water that may collect there. It is common for them to be missing altogether or worn out. This tube connects the headlight to the body on the later bugs. It protects the wiring from being damaged by debris that might be picked up from the tires and from water, which may get into the wiring. These are often cracked and rotten. 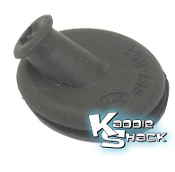 This is the grommet that is in the floor pan under the rear seat area that prevents the clutch and accelerator cable guide tubes from vibrating against the body and wearing a hole in them. It also prevents moisture from entering in this area. Replace all your cracked and weather-checked window seals with this high quality set. 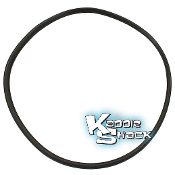 These are "Cal-Look" seals, which have no metal insert, making them more affordable and easier to install than the "American Style" ones with the metal. 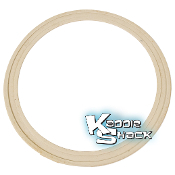 Replace all your cracked and weather-checked window seals with this high quality set. 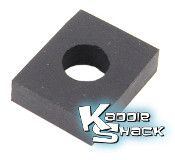 These are standard, or "American Look" seals, which have a groove for the stock metal insert, making them more a direct replacement for the factory seals. 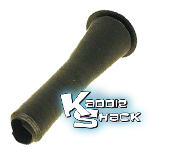 Replace all your cracked and weather-checked window seals with this high quality set. 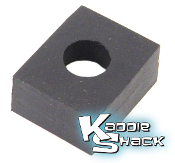 These are standard, or "American Look" seals, which have a groove for the stock metal insert, making them more a direct replacement for the factory seals. Also fits '72 Super Beetle. 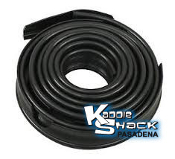 Replace your leaky, cracked windshield seal These are "Cal-Look" seals, which have no metal insert, making them more affordable and easier to install than the "American Style" ones with the metal. Replace your leaky, cracked window seals with these quality replacements. These only fit standard quarter windows. Sold in pairs. 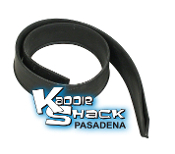 Replace your leaky, cracked pop-out window seals with these quality replacements. These only fit pop out windows, not standard quarter windows. Sold each. This "Pinch Welt" seal is the u-shaped seal that surrounds the metal in the body before the popout window fits into it. The headliner tucks underneath it, and the rubber seals up against it when the window is closed to prevent leaks. Sold each. This off-white colored "Pinch Welt" seal is the u-shaped seal that surrounds the metal in the body before the popout window fits into it. The headliner tucks underneath it, and the rubber seals up against it when the window is closed to prevent leaks. Sold each. 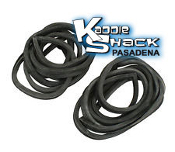 Replace your leaky, cracked rear window seal. 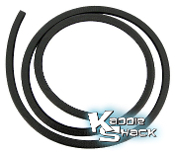 These are "Cal-Look" seals, which have no metal insert, making them more affordable and easier to install than the "American Style" ones with the metal. Rain and wind leaking in your vent windows? Replace your seals with new ones. Shown in red. Are your window channels deteriorated and falling apart? Replace them with these new ones. Shown in red. This is the seal that installs between the frame on your vent wing and the glass itself. It holds the glass in place to the frame and prevents water from leaking in. 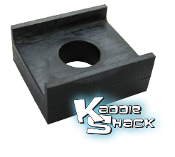 Quality replacement exterior frame trims with rubber scraper to keep water out of your door, and keep the glass from scratching as you roll the window up and down. This is the seal where the speedometer cable goes though the body by the fuel tank. This is the seal that the speedometer cable slips into in the spindle on the driver's side. This is the seal that installs under the interior light switch in the door jamb to prevent water from getting into the switch. These are the seals in the door jamb that keep water out of the check rod that holds the door from opening too far. If squished or damaged, water can enter the body and promote rust. This is the seal that installs between the exterior mirrors and the door. 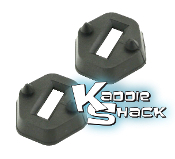 This rubber pad mounts provides cushion between the body and the pan to prevent cracking when the body flexes. There are two located at the shock tower area, one on each side. 10mm thick. This is the seal that installs between the latch on your deck lid and the deck lid itself. 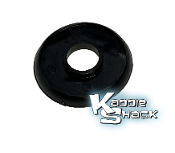 Do you need to replace the seal between the floor pan and body? This kit comes with all the seals you need. This is the open foam seal that installs between the gas tank and the body. 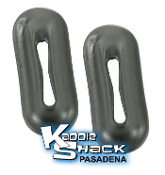 It prevents metal-to-metal contact that would cause chafing and/or squeaking.